While the world is distracted with Donald Trump’s possible ties to Russia, Washington continues to grind forward with his agenda. In a recent move, the Trump Administration has taken a major step that will help the nation’s wealthiest at the expense of households with low or moderate incomes. 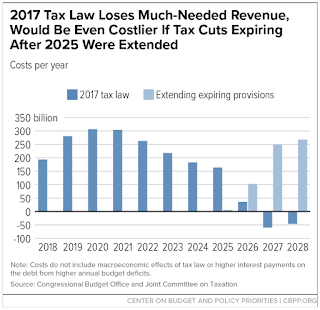 In September 2018, the House is expected to vote on the “2.0” tax plan, a plan that would permanently extend the 2017 tax law’s individual provisions that were set to expire after the year 2025. According to an analysis by the Center on Budget and Policy Priorities, the proposed changes will exacerbate America’s growing problem of income inequality and hurt the nation’s overall fiscal picture. 1.) 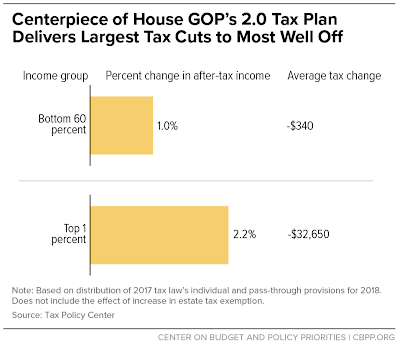 Cutting the top individual income tax rate – the 2017 law cut the top tax rate from 39.6 percent to 30 percent benefiting couples that make over $600,000 in taxable income. For a married couple with $2 million in taxable income, their tax bill will be cut by $36,400 annually. 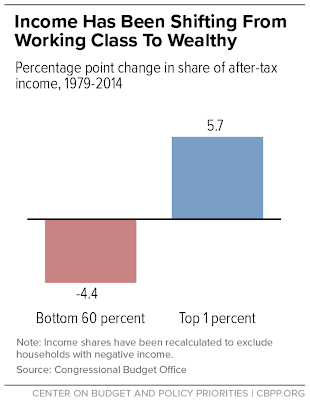 Other cuts in tax rates for the wealthy will result in the same household saving $56,765 annually. 2.) Estate tax exemption – the amount that wealthy households can pass on to their heirs has doubled from $11 million per couple to $22 million per couple. Those poor, sad couples with more estates worth more than $22 million will see their estate taxes cut by $4.4 million each. 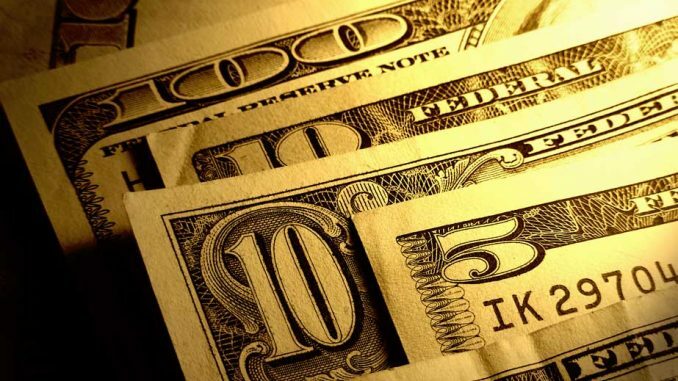 As well, thanks to new tax provisions that shield “unrealized capital gains” that have never been taxed will ensure that those who inherit the estates will never have to pay tax on their “estate lottery winnings”. 3.) Deduction for pass-through income – this is income that the owners of businesses like partnerships, sole proprietorships and S corporations report on their individual income tax returns. Before the 2017 law was enacted, this income was taxed at the same individual rate as a business owner’s salaries and wages. 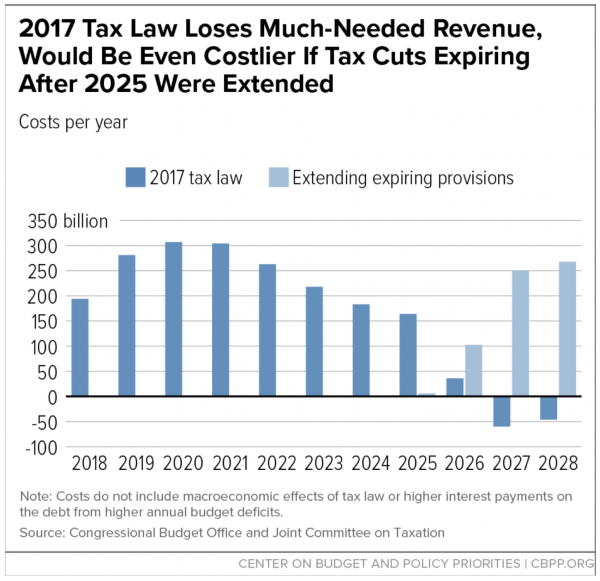 The 2017 tax law change means that the deduction for pass-through income cuts the marginal individual tax rate by 20 percent. This provision provides the most benefit for households in the top one percent since they will be able to avail themselves from 61 percent of its total benefit compared to only 39 percent for the 99 percent of us. 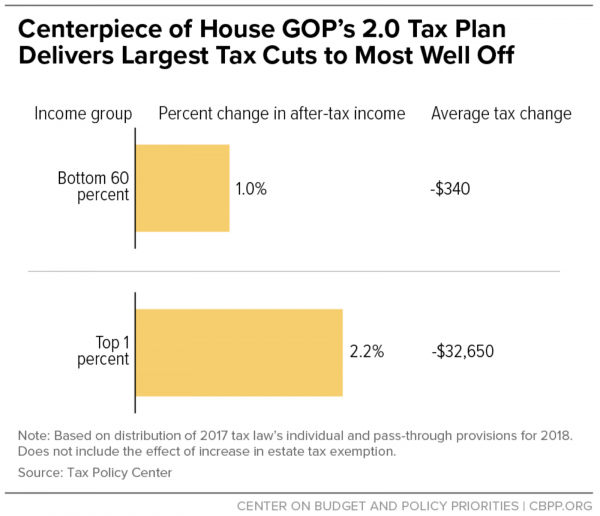 While everyone loves to see taxes cut, as you can see from this analysis by the Center on Budget and Policy Priorities, the cuts in taxes are mainly accruing to wealthy Americans, the people that are far more likely to rub shoulders with and make substantial campaign contributions to policymakers in Washington than Main Street Americans. As well, given that Washington’s current illusion of fiscal health is seen through the rose-coloured glasses of an extended period of ultra-low interest rates, the idea that these tax cuts could be permanent is highly, highly unlikely.